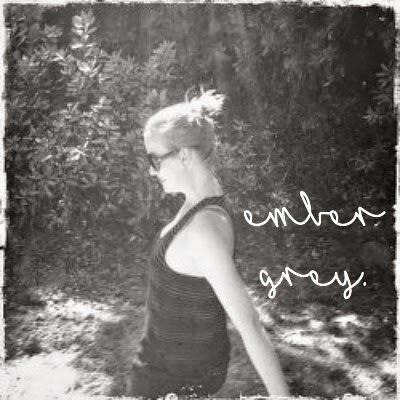 Emily is the blogger behind the beautiful space, www.embergrey.com. More than a blogger, Emily has become a dear friend, and my soul sister. 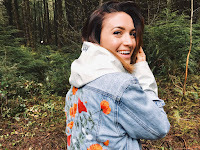 I found Emily's blog in a trying time in my life when I was deciding whether to commit to a blog and a career and educational path that involved writing, or stick to the safe route I was travelling on. She wrote a post, The Past has Passed, and I cried at my desk. That is the beautiful thing about this space we create, this space that involves so much heart and passion : every blogger has the opportunity to connect with strangers, to give people the hope they were hoping to discover. For me, hope was found in Emily's blog. And since then, I find myself travelling back to her blog each week, connecting to her posts. I laugh, I cry, but most of all, I leave her blog feeling brave. 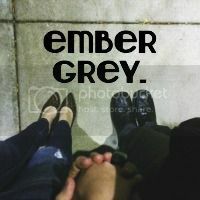 Emily's blog contains a kind of heartfelt honesty and love that is one of a kind to Ember Grey. And today, she's sharing her lovely philosophy on life. I love it and I know you will, too. What do you think the three most important parts of living a meaningful life are? // Gratitude, Compassion, and Self Love. - Gratitude // There really is something to starting each day with a grateful heart and for me, this practice has helped tremendously on the really hard days or times I am going through a valley. Remaining grateful doesn't mean you'll never have a bad day again, but it certainly puts things into perspective when you do. One of my favorite quotes is "Gratitude begins where entitlement ends." - Steven Furtick. This is something I have to check myself on often - putting praise and thankfulness into the beginning of my day rather than waking up and thinking "I need [and deserve] this and this and this in order to have a good day." Any day we wake up breathing is proof that we are alive and have purpose in this life. -Compassion // I have wanted to save the world since I was a little girl, and while I now know that alone I cannot save it, I do believe that through acts of kindness and banding together with others, we can absolutely change it for the better. That, to me, is what life is about. Less judging, more compassion... it's not always easy (especially in the world we live in today), but the truth is- everyone has a story, and we all just want to be loved and feel like we matter. -Self Love // This was a hard one for me to grasp for awhile and it actually took allowing my heart to be broken by someone else to realize how important it is to first love and respect myself. I think when we reach that point of self respect and love, we can pull our own heart through whatever we may come to or go through. Whether it's cutting ourselves some slack (because nobody is perfect), a self pep-talk (keep pushing forward), knowing how to protect one's self (sometimes it's okay to walk away), or the daily lessons of learning how to be comfortable in your own skin - self love actually makes more room in our hearts to love others and to love them well. What are three non-essential things that get you through the day? // Music, Coffee, and my best friend. Coffee // A true addiction, I'm sure of it, but I literally cannot function without at least one cup. I usually have 2 cups in the morning and then a cup of decaf in the afternoon. What does the world need more of? // I would have to say compassion. Again, I think if more of us took more time to think of others than we do ourselves, this world would be in a much different and more peaceful place. What is your personal mission? // To wake up each day with a grateful heart, to work really hard and to push myself to be a better person, and to live a life that glorifies Jesus. So there I was in the card aisle of Walgreens, bawling my eyes out. This picture (I'd found) was a reminder to remember who I was. Who I still was. How God sees me, no matter what I've been through. It's how God loves my soul. This reminder was a life jacket carefully thrown out to me while I was so, so busy just trying to keep my head above water. It was a gentle and beautiful and strong reminder. God is gentle and beautiful and strong. And nothing we do or go through will ever change the way God sees us. We are so fiercely loved. What is your favorite quote? // I have many, and my favorite will change depending on what's going on in my life at that moment. One of my all time favorites though is, "She stood in the storm, and when the wind did not blow her way, she adjusted her sails." - Elizabeth Edwards. Fill in the blank. Life is... // hard and beautiful, but more so, life is a journey to be lived, experienced. Make every day count for something, this is the most important journey we will ever walk. Love you, soul sister! I am so happy to have met you. Thanks for sharing a piece of your beautiful heart. I loved her questions, too, Melissa! :) Super fun to reflect on and answer! Of all the bloggers I have come across over the years and in my year of blogging I can honestly say that the 2 of you are the most genuine, open, soulful, and beautiful writers I have come across. I would love to just sit with the 2 of you and soak up that positive vibe and your views of the world and those in it. You both amaze me and you're both beautiful, inside and out! Well this means SO much, especially coming from you, Anne! I love that our blog worlds collided when they did! XO!